We've all seen it. The toddler weeping as if her little heart will break as she clings to her mother's pant leg, absolutely determined not to let Mom out of her sight. Meanwhile, teacher, grandparent, or sitter stand by, desperately trying to coax the little Cling-On away with noise making toys, promises of ice cream for dinner and visions of "what FUN we're going to have." Mom then does one of two things. She stops, gathers her little one in her arms, and coos and cuddles her, calming her down and thus giving in completely. You can already see the wheels turning ("Well, I'll call Janice and just reschedule lunch for sometime next week. She'll understand."). Or, flushing red with embarrassment at the attention the predicament is causing, she extracts her leg from her little one and flees in a panic, determined to get as far away as possible as quickly as possible. So which reaction is the RIGHT one? Neither. By giving in and staying with your little one, you are inadvertently teaching her to cry and throw a tantrum until she gets what she wants. In this case, Mommy to stay. 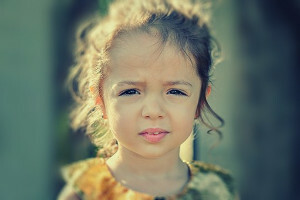 By beating a quick retreat, you are causing temporary separations to seem like abandonment in the eyes of your toddler. This only leads to a drastic increase in fear and panic whenever you must be apart. Okay know it all, you're saying, so what am I SUPPOSED to do? How would YOU handle the situation when you have banana now smeared all over your new silk pants, you're cruising on three hours sleep,one cup of coffee, and you're not even sure you remembered to rinse the shampoo out of your hair in the shower this morning? Prepare your toddler ahead of time. Remind them the night before, the morning of, and on the way in the car. "Mommy has to go meet someone, but you get to spend time with Grams and Poppy today, and you guys are going to do all sorts of neat things!" Or "Grandma and Grandpa Billy Goat (okay, this may make no sense to you, but my family understands what I mean) are going to take you to the zoo this afternoon, won't that be fun?" Make the 'trade-off' quickly. When you arrive at your destination, carry your child if possible. Then hand your child over to the sitter (you can do this in your living room too), or at preschool set your child down with other kids who are already involved with toys or something interesting. This is telling your child, okay, you were with Mommy or Daddy, now you're going to spend some time with Grandma, or stay here and play with these kids. Give your child a kiss, say something upbeat like, "See you later! ", "Be back before you know it! ", and get out. Do not stand around and discuss anything with the teacher (if this needs to be done, ask the teacher to step outside the room with you - out of sight of your little one - or make an appt for when you come back at the end of the day). Don't catch up with Grams, save that for over the phone or later on when you're together. This quick, definitive action teaches your child some key things. Primarily, that this IS happening, and there is no use getting upset over it. And secondly, that being separated is no big deal. It might even be fun. Let's also all understand that there are going to be good days and bad days. There WILL be days where you walk out of the room to the sound of your precious, adorable little child screaming in a violent rage of protest. And that sound is going to rip your heart out with a jagged knife and shred your stomach to bits with a rusty fork. You may very well get to your car and find yourself beating the steering wheel mercilessly and smearing your mascara around to your ear. AND THAT'S OKAY. It's natural to feel upset about being separated from your child, just as it is natural for them to feel the same being separated from you. Just remember that what you're working toward is establishing your children's independence and confidence in themselves. Your children are no longer simply an extension of you. They are their own amazing little individuals, and they need the chance to understand that.